Please Join Us in Congratulating D. William Boy, CPA as June's Logan County Chamber Business & Entrepreneur of the Month. In November of 1994, Bellefontaine native, Bill Boy, with the help and support of his wife, Amy (MacGillivray), opened his CPA practice. Bill drove throughout Logan County, visiting the small businesses and introducing himself as a "new CPA in town, if you need someone, let me know." Twenty-three years later, his humble beginning has evolved into a thriving practice that currently employs four accounting professionals and an administrative assistant. 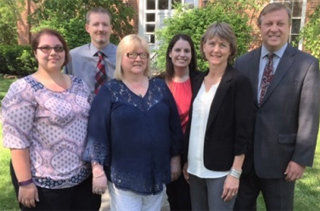 Working alongside Bill is Cory Savage, C.P.A., Christine Yoder, Accountant, Nicholle Lang, Staff Accountant, Nichole Jackson, Staff Accountant, and Russlyn Phelps, Administrative Assistant. His business has not only grown to include additional employees, but in the services that he offers his clients. This practice began with various forms of accounting and tax preparation and has expanded to include financial advice, business start-up consulting, Quickbooks consulting, payroll preparation, payroll taxes and year-end work, monthly expense/bill payment, financial statement preparation and review/compilation work, preparation of income taxes including all business types i.e. Corporate, Partnership, S-Corporation, as well as individual (including Sole Proprietorships, Limited Liability Corporations) Estate, Non-Profit Organizations, as well as amendment of prior year's returns and more. At D. William Boy, C.P.A., their focus is on providing the best service possible and meeting all the needs of their clients. If they don't know the answer, they will research it until the answer is found. "Our goal is to have the utmost integrity in all we do and to provide excellent service to our clients." They believe this is the foundation for building a successful, thriving business, as it will not only retain clients, but the overflow of excellent service will spill out into client referrals. 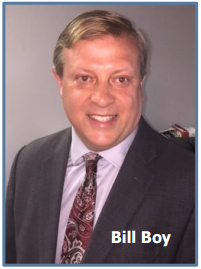 Each year, during tax season, Bill offers an internship to a student majoring in accounting, so that he/she may gain some practical work experience in the preparation of income taxes, as well as the workings of payroll, payroll taxes, and year-end work. This paid internship offers the student valuable experience and insight to help them determine their future goals for their accounting career upon graduation. One interesting fact that many may not know, is that their business is located in the beautiful, historic home built by Judge William Lawrence, which is listed on the National Registry of Historic Places. Judge Lawrence served others in various capacities. He was a U.S. Representative, and was instrumental in founding the American Red Cross, and creating the U.S. Department of Justice. He also served as the editor of the Logan Gazette, now known as the Bellefontaine Examiner. Bill is honored to be able to serve the needs of his clients in the former home of someone who believed so strongly in working to make the world a better place. Bill and Amy chose Logan County for many reasons. They both grew up here and they love the rolling hills and the four seasons. With a county that boasts skiing in the winter and boating in the summer, beautiful rolling hills and countryside, and only an hour from the city, "Why would we want to be anywhere else? This is a great place to have a business and raise our family." Bill and Amy reside just outside of Bellefontaine and strive to do their part to keep Logan County thriving and growing, so that their children Hannah, Daniel, Jacob, Marjorie, Ruth, and Brody will want to raise their children here. When asked why he has chosen to partner with the Logan County Chamber of Commerce through membership, he stated, "The Logan County Chamber does much to support and enhance our community, so it only made sense for me to join their efforts." He believes that helping to build the community begins by being involved in the organizations that support that community. Bill is not only a Chamber member, but also serves the Logan County community as a member of the following organizations. He is currently in his second term on the Hilliker YMCA Board where he has served as Treasurer and President. He is a member of the Exchange Club and the Rotary Club where he has served as Treasurer for both and President for the latter. He is currently serving as the Clerk for the Village of Valley Hi and as the Fiscal Officer for Lake Township, and is the President of the Bellefontaine High School Athletic Booster Club. He currently serves in various capacities at his church and is a past Treasurer for the Logan County Chamber Board. Bill stated, "As I serve with these organizations and am a part of the Chamber, I receive the benefits of being part of a vibrant and growing community." We thank Bill Boy and his staff at D. William Boy, C.P.A, for their 22 years of Chamber membership and for their 23 years of service and commitment to Logan County.